Fuse: An electric fuse is a device that is used to protect electric circuits and electric appliances against high current caused by short – circuiting or overloading due to withdrawal of large current. A fuse is a short piece of wire made of a material of high resistance and low melting point. Egs zinc, copper. A circuit breaker is an automatically operated electrical switch designed to protect an electrical circuit from damage caused by excess current, typically resulting from an overload or short circuit. 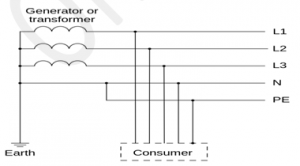 Its basic function is to interrupt current flow after a fault is detected. Unlike a fuse, which operates once and then must be replaced, a circuit breaker can be reset (either manually or automatically) to resume normal operation.